And welcome to our first challenge at Inksprational for 2019. This challenge has been chosen by our fabulous teamie Anila. 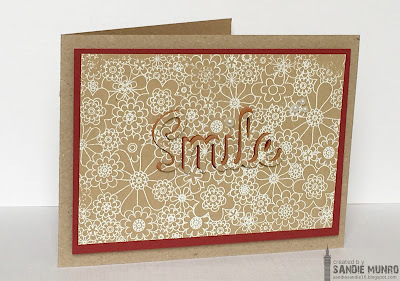 I used the background full floral stamp by CAS-ual Fridays-heat embossed onto the the kraft card. I die cut the 'smile' sentiment from this-also CAS-ual Fridays. Then die cut the sentiment again in fun foam to add dimension and used a burghaundy card base before the kraft base. 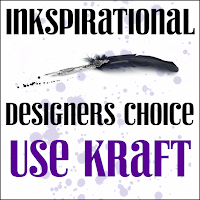 Have a look at the amazing DT kraft projects here and then get crafty and join us. I think white on Kraft looks so neat and clean somehow. It’s a beautiful background stamp and I like how you can see a little of the red and Kraft shadow behind the sentiment. Mega watt smile happening as I gaze on your lovely white/kraft card! Love the field of blooms and whisper of burgundy framing! Love how the pop of red adds a touch of zing to your card. Gorgeous! I love this! The floral looks great in the white-on-kraft colour scheme and the choice of accent colour and the die-cut sentiment are all beautifully done. Hi Sandie hope you are well. I love how crisp the embossing looks on Kraft and the raised sentiment gives great dimension to this pretty card. Beautiful embossing and dimension Sandie! Fun card - I just love those "hidden" die cuts! Smiling wide! This gorgeous bg stamp in white looks so beautiful on kraft. I have loved playing at all the Ink challenges and this one makes me itch too. LOVE how you created dimension for your sentiment with the foam! Great idea!